For fog, rescue or any emergency signalling, our gas horn is an essential part of every vessel’s safety kit. Our safe and non- flammable gas horns are extremely loud and reach 120 Decibels meaning they can be heard up to a mile away. As well as top quality sound, another advantage of our horns is that they are extremely easy to assemble with a push button activator making the horn reliable and simple. The Simply Breathe gas horn is great for sporting or leisure activities. The safe, non-flammable gas horn provides a reliable solution for gathering attention or launching an event. Our cost effective gas horn is ideal for coaches, sports officials, lifeguards and referees. 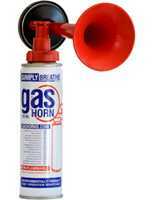 Fishermen and Boaters will find the environmentally friendly nature of the gas horn an attractive option.